Buko Salad is one of Filipino’s favorite desserts. 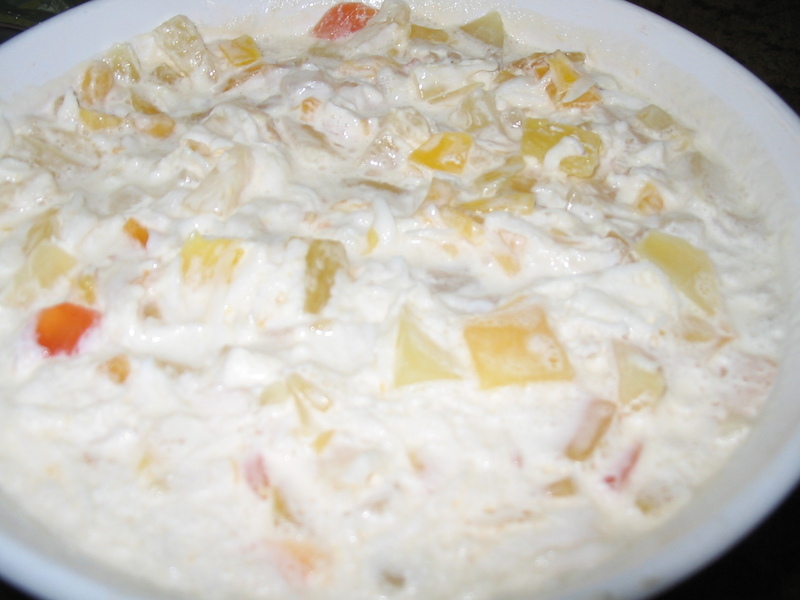 The Buko Fruit Salad is one of the variety of buko salad where fruits are now added to it. “BUKO” is the meat of a fresh young coconut. The photo above is a “Buko Salad” given by our church friend. All of us in the church enjoyed this food as it was truly yummy. The salad is sweet, creamy and has lots of “buko” which made it even more luscious. This is one of my favorite desserts and I am excited to have another eating fellowship in the church so that I can enjoy another bowl of this. LOL! Anyway, are you finished with your Yummy Sunday posts? If so, please don’t forget to put your link on the Mr. Linky below. Please leave a comment too after linking. Next Sunday will be Yummy Sunday 10 . Since it’s going to be our 10th post, lets make it special by making a post entitled “My Favorite Food“. Of course you will have to share a story behind that food and why it is your favorite. Make your post interesting, unique and creative. Don’t forget to invite others to join too. There will be surprises to those who will join… The surprise will be announced this week, so keep updated. God bless everyone and happy Yummy Sunday! kinsa diay ang ngbuhat ana? 🙂 it looks so yum! I miss buko salad..I’m drooling now..he..he..Mine is up too. haven’t had the chance to join yummy sunday for a few weeks, sensya na. I missed buko salad talaga, ga laway na ko hahahaha! I’ve never had it. Sounds a lot better than “fruit salad” where they use mayonnaise. I have joined! I didn’t know you’re the host now. 🙂 Hope I’m not late yet. I am doing fine Bogie..thanks for asking. How about you?